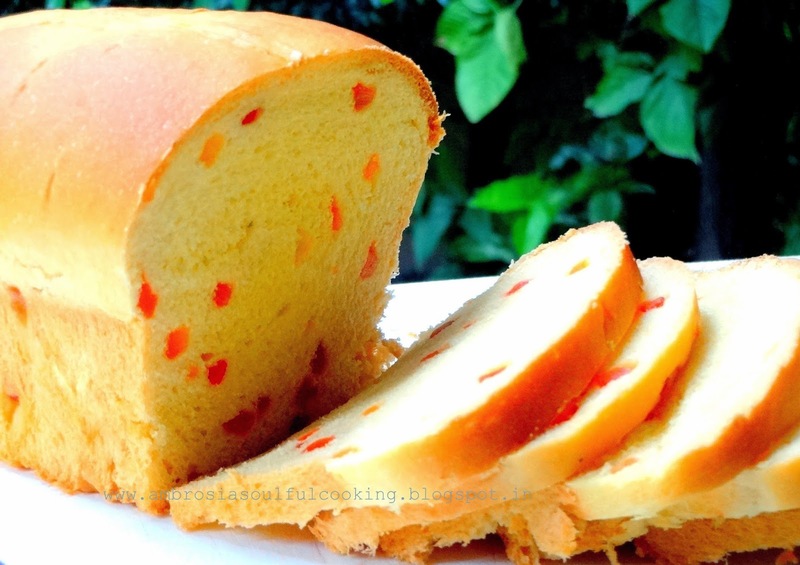 Tutti Frutti bread invokes childhood memories. 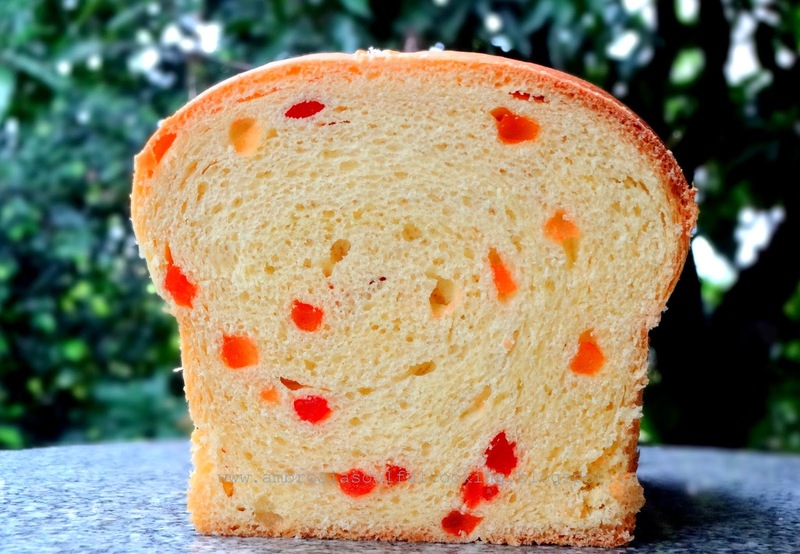 As kids, we loved the bread with colourful pieces of chewy tutti frutti embedded in the slices. We would sometimes pull out and eat tutti frutti first and then enjoy the slice. 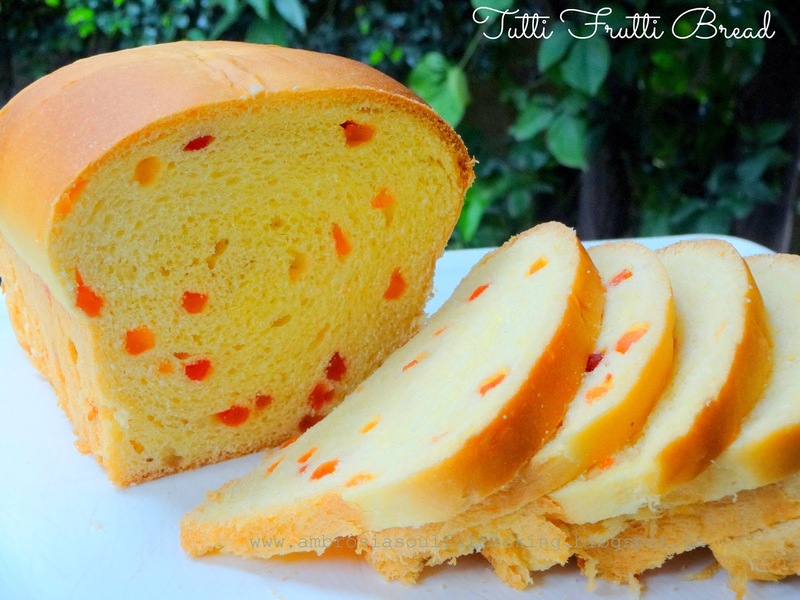 Tutti frutti bread tasted best with a generous coating of butter. I had to keep my promise and my hunt for the recipe took me here and here. I adapted the recipe minimally according to the ingredients I had at home. Dissolve sugar in ½ cup warm water. Stir in yeast. Whisk together flour, custard powder, milk powder and salt. Add butter and oil. Mix well. Add tutti frutti. Add yeast mix and knead. Add water according to requirement and knead for about 10 minutes. Dough will be hard and sticky, keep adding water and knead till it becomes soft and elastic. It will take another 4 to 5 minutes. Transfer dough to a greased bowl. Turn the dough so that it is evenly coated with oil. Cover and leave to rise till it becomes double its size. The time for dough to double might vary. It took 3 hours for the dough to double in size. Knock down the dough on a floured counter. Roll out the dough into a rectangle not bigger than the width of the pan you are using. Roll the dough towards you, tightly. Pinch seams to seal. Grease one 7 inch x 3 inch loaf tin. Place the roll in the greased loaf tin with the seam side down. Cover and keep it to rise for 1 ½ hours in a warm place or till it rises ½ inch above the lip of the pan. Preheat the oven to 180 degrees. Bake for 30 to 35 minutes till the top turns golden and the bottom sounds hollow when tapped. Tent with a foil if the top is browning too fast. Remove from pan after 5 minutes. Cool in the rack. Slice next day. My notes – Too much of sugar in dough makes yeast sluggish. The dough took 3 hours for bulk fermentation. Make sure your dough doubles no matter what time it takes. Second rise also took 1 ½ hours. I had to heat the oven mildly and place the dough in the oven to rise. When do we add the milk powder? Hello Chaitra, Whisk together flour, custard powder, milk powder and salt. I have mentioned in the recipe. Thanks for bringing it to my notice. lol! shaping a bread is just a matter of practice and some experience. I am sure that you will master it soon. I am pasting a link. I am sure that it will help you. Do let know. Happy bread shaping! Can I use active dry yeast instead of instant dry yeast? What would be the measurement? Hello Swati, Yes, you can use active dry yeast. Add a little more. In the proprtions that I have given, you may use 2 teaspoons. And yes, use it only when it bubbles well. Active yeast has been quite unreliable at times. I use instant dry yeast for my breads. Happy Baking! can this be made in a ring shape cake mould? Hello Nidhi, I am not too sure about baking this bread in a ring shape cake mould. Will the dough fit into the mould ? Cake batter is runny and hence fits into the nooks and crannies of the mould. Well, you must try. It will taste good anyway. Hi there! Yes, you may add yeast to water sugar mix. Because of 5 tablespoons of sugar, the solution is viscous and yeast will not dissolve completely. But thats ok. However, if you are using instant dry yeast, you may add it to flour mix directly. Hello Charandeep, Your lovely comment makes my day. If all your breads are coming out so well, then you have a talent for baking. I would love have loved to see the pictures. Wish you many more great breads ahead Charandeep! Thank you Namita! You are such an encouragement. can I replace milk with milk powder? if Yes, what would be the measurement of milk? Hello! Sure you may use milk powder. You will have to add water to make 3/4 cup warm milk. If you are in a cold area, dough will take longer to rise. And you'll get a milky tutti frutti loaf! Will instant dry yeast bubble up after adding it to sugar water..do we have to wait for the froath..
Hello Ruchi, Instant dry yeast can also be added directly to the flour. We add it to sugar water to ensure that it is alive and working. You may add it to sugar water and cover for 10 minutes. It should turn frothy. Hello Nair, I will keep your suggestion in mind. Next time I will definitely take pictures of different stages. Thanks! This recipe of yours is a total winner. 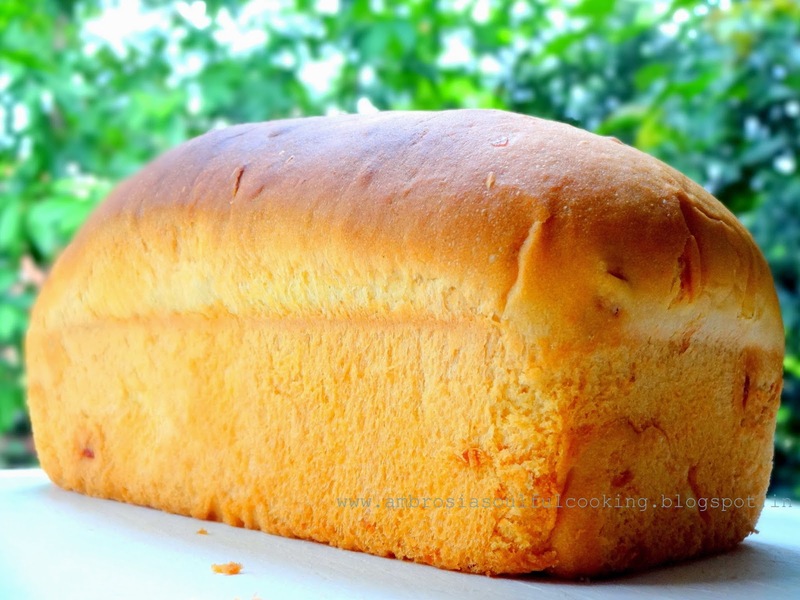 My husband and me loved this bread so much that I am regularly baking it since few weeks now! Thank you so much !! Hello Aditi, It gives me immense pleasure to know that you baked the bread and loved it too. Thank you so much! Hello is yourcup 250 ml? Hello Manik, I use standard 240ml cup. Can I use whole wheat flour instead of all purpose flour and stick on to same measurements? Hello Indhu, You may use whole wheat flour. the dough will take a longer time to rise and the crumb will be dense. How about 50% whole wheat and 50% apf?